Scholarly publishing is evolving in many ways, as anyone connected to academia knows. Discussions about publishing often center on the potential that digital technology offers to disseminate the results of scholarly research, a role traditionally filled by scholarly associations, societies, university presses, and commercial publishers. Scholars and researchers at institutions ranging from Ivy League universities to state colleges are raising questions about how non-traditional “digital” scholarship will be evaluated, what criteria and credence should be given to new, openly accessible online journals, and what role open access repositories have in disseminating and preserving the scholarly record. Reaching even into public policy, the Office of Science and Technology Policy (OSTP) convened a Scholarly Publishing Roundtable in 2009. That group’s final report offered the recommendation that each federal research agency (National Science Foundation, National Endowment for the Humanities, etc.) should expeditiously develop and implement public access policies, offering free access to results of federally funded research. 2013 saw OSTP revisit that recommendation and, in response to an overwhelming petition, issue a directive to all federal funding agencies with more than $100 million in R&D funding to develop and implement open access policies, similar to the National Institute of Health’s Public Access Policy, in effect since May 2, 2005. Responding to these “tectonic shifts in publishing,” university libraries and academic librarians are undergirding a system that is shaky at best. Budgets remain flat, while subscription costs continue to rise; all the while many libraries are investing in staff and infrastructure in the area of scholarly communication, supporting open access initiatives, or moving directly into publishing themselves.3 While the primary push for adapting this system has been working through disciplinary faculty to change research culture, academic librarians are slowly engaging the idea that publishing practices within our own journals and professional writing could be an effective way to mold the future of academic publishing. The scope of this article is to engage our own community, librarians who publish in professional or academic literature, and target pressure points in our subset of academic publishing that could be capitalized upon to push the whole system forward. We are approaching this topic with the goal of plainly sketching out what LIS publishing looks like currently, in terms of scholarly communication practices like copyright assignment, journal policies for open access self-archiving and open access publishing. Studies of this magnitude have been conducted in the recent past, although they have primarily focused on the attitudes of individual librarian authors toward publishing practices more than analyzing the publishing practices and policies journals themselves. Elaine Peterson, in 2006, produced an exploration of “Librarian Publishing Preferences and Open-Access Electronic Journals”, in which she conducts a brief survey. The results show that academic librarians often consider open access journals as a means of sharing their research but hold the same reservations about them as many other disciplines, i.e. concerns about peer review and valuation by administration in terms of promotion and tenure.4 This line of thought is continued in Snyder, Imre and Carter’s 2007 study, which focused more specifically on intellectual property concerns of academic librarian authors and allowable self-archiving practices. They quote Peter Suber, author of Open Access and director of Harvard’s Open Access Project, writing, “‘There is a serious problem [serials pricing and permission crisis], known best to librarians, and a beautiful solution [open access] within the reach of scholars.’ One can draw the conclusion from Suber’s statement that librarians as authors should be the most prominent supporters of open access and that, as scholars, they would practice self-archiving.”5 This study in particular lays a unsettling foundation that 50% of respondents cared mostly about publication without considering the copyright policies of the journals in which they published and that only 16% had exercised the right to self-archive in an institutional repository. ((Ibid)) These and other similar studies highlight the simple fact that concerns about changing publishing habits are the same within librarianship as they are in many other disciplines. College and Research Libraries (C&RL), a well-regarded journal for academic librarianship, published four articles between 2009 and 2013 that studied the publishing practices of academic librarians through surveys.6 Each has contributed valuable insights while reaching very similar conclusions across the board. Palmer, Dill and Christie conclude that in attitude, “Librarians are in favor of seeing their profession take some actions toward open access […] yet this survey found that agreement with various open access–related concepts does not constitute actual action.”7 Mercer, focused on the publishing and archiving behaviors rather than attitudes of academic librarians, highlights the substantial differences between the dual role many academic librarians inhabit; library professional first and academic researcher second. She writes, “…librarians may be risk takers in their professional roles, where they are actively encouraging changes in the system of scholarly communication and adoption of new technologies but are risk-averse as faculty in their roles as researchers and authors.”8 Taken together, the research could lead one to think that academic librarians are invested in changes to the scholarly publishing system about as little as disciplinary faculty and are just as cautious about evolving their own publishing habits. Jingfeng Xia conducted a fascinating study proposing that the h-index of authors published in a journal, as opposed to that journal’s impact factor, could provide an efficient method of ranking LIS journals, especially those that are open access and not listed in Journal Citation Reports. Xia’s article also underscores some of the complications that arise when lumping together all journals in the Library and Information Science field; Library and Information Science Research (LISR), a researcher-focused journal published by Elsevier (h-index = 21, impact factor = 1.4, not open access) is judged alongside D-Lib Magazine published by the Corporation for National Research Initiatives (h-index = 33, impact factor = 0.7, open access), a journal aimed at the practice of digital librarianship. LISR’s impact factor (1.4) is high for LIS journals (median 0.74), but when compared to the h-index of D-Lib’s authors LISR seems to have less “impact.” Xia’s employment of the h-index as a measurement, illustrated in this example, shows the breadth and depth that alternate matrices may introduce, the complications of judging journal quality based on citations, and the potential inversion of perceived impact depending on how one looks at it. Expanding on the idea that acknowledging the perceived quality of journals is a valuable practice within librarianship, Judith Nixon’s “Core Journals in Library and Information Science: Developing a Methodology for Ranking LIS Journals” was published in 2013 by C&RL. She proposes, based on successful practices at Purdue University Libraries, that “Top LIS journals can be identified and ranked into tiers by compiling journals that are peer-reviewed and highly rated by the experts, have low acceptance rates and high circulation rates, are journals that local faculty publish in, and have strong citation ratings as indicated by an ISI impact factor and a high h-index using Google Scholar data.”10 The production of a ranked list like this aligns perfectly with the type of study we performed, and our conclusions will highlight some similarities and differences between Nixon’s list and our findings, pitting the Journal Openness Index (J.O.I) Factor against the Top Tier journals she presents. Whereas some of these studies in LIS publishing focused on the “people” angle, studying librarians and their attitudes and practices around publishing, we chose to follow more recent research and widen the lens to look at the journals in which librarians might publish. A challenge presents itself when broadening to this scale: there is the ever-present blurred line between the publishing habits of working librarians and those of teaching/research faculty in library schools and academic departments — Library and Information Science Research vs. D-Lib Magazine for example. There are obvious differences between these groups, so pairing analysis on the specific journals where professional librarians typically publish with the more specific studies on that same group’s publishing habits will present the most accurate portrait of the scholarly communication landscape as it has been studied to date. We leave the extension of this research for future study. Our live dataset is viewable on this Google Spreadsheet. Downloadable and citable data are accessible on figshare. The journals that we began with came from an internal list compiled as part of a professional development initiative at Florida State University Libraries. A student worker in the Assessment department compiled the original list of 74 journals, and then the co-authors of this piece expanded that list to 111 after consulting the LIS Publications Wiki. The journals were ingested into a spreadsheet with columns for impact factor, scope, instructions for authors, indexing information and other common details. Our first task was to add columns for copyright policy, open access archiving policy, and open access publishing options. Our journal list includes an extraordinarily broad range of journals including research focused journals and those in subfields of librarianship like archives and technical services. This decision was made so as to gather data from the broadest possible representation of LIS scholarship. After compiling and organizing the journal list, we collected each journal’s standard policies on copyright assignment, open access self-archiving (“green open access”), and open access publishing (“gold open access”). We began gathering these data by searching the SHERPA/RoMEO database for commercial journals and the Directory of Open Access Journals (DOAJ) for open access journals. After searching these databases, we double checked policies and open access options on the journal and/or publisher’s website using the following workflow: locate the policies section of the website, which is commonly labeled “Policies,” “Policies and Guidelines,” “Author’s Rights,” or “Author’s Guidelines”; identify the copyright policy of the journal; identify the open access self-archiving policy or “green open access” options that the journal permits; identify the open access publishing or “gold open access options” of the journal, which may be listed in the policies section or a specific “Open Access Options” section; and finally view the copyright transfer agreement or other author agreement, if available. All details were inputted to the spreadsheet and coded for consistency. Grading journals based on how “open” they are, as opposed to citation impact or h-index, is a novel approach, and one that had not been applied to LIS literature to our knowledge. In fact, it is not clear that this measurement has been used extensively in any field or practice aside from the production of the spectrum and some supporting documentation by PLOS, SPARC, and OASPA. Potentially then, as further research is done using the J.O.I Factor, the grades we apply to journals herein may be different based on how many measures of openness are used and how they are counted. Our proposed enumeration of the J.O.I Factor is indicated on the image below, superimposed over the “How Open Is It?” scale produced by SPARC/PLOS. The application of J.O.I Factors to specific journals is contained to our Conclusion section for purposes of clarity and emphasis. Our proposed Journal Openness Index, adding numerical values to PLOS/SPARC’s How Open Is It spectrum. The original spectrum breaks openness down to six categories, three of which overlap neatly with the criteria we used in our analysis: 1) Copyrights, 2) Reuse Rights, and 3) Author Posting Rights. The remaining categories, Reader Rights, Automatic Posting, and Machine Readability were mostly ancillary to our focus, and so the J.O.I Factor numbers that we apply only account for the three criteria we researched. The “Reader Rights” category does include some details about embargoes but typically refers to embargoes on the final published PDF released after that term expires by the publisher. Our use of the embargo data point was in terms of Author Posting Rights, so we chose not to include Reader Rights as a category in our J.O.I Factor calculations. Also, the spectrum lumps open access publishing options, another of our data points, in with Reader Rights as “immediate access to some, but not all, articles (including the ‘hybrid’ model” — “hybrid” meaning the business model where articles can be made open access on a one-by-one basis for a fee. We decided to add a “-” for journals that offer open access publishing for a fee, illustrating the negative connotation that might have for authors. Journals that are fully open access without any publishing fees will have a J.O.I number and a “+” illustrating positive connotations. Information Technology and Libraries, for example, published by Library and Information Technology Association/ALA, would have a J.O.I Factor of 12+; four points for author retention of copyrights, four points for broad reuse rights (CC-BY), four points for the author being allowed to post any version of the article in a repository and “+” for the journal being fully open access without imposing any publication fees. We hope that the application of the J.O.I Factor in this article serves merely as a proof of concept, and we invite colleagues to use our data, apply J.O.I Factors to all the journals we listed there, and extend this work to account for the full range of possible factors of openness. Table 1: Journal policy codes as applied to our data. 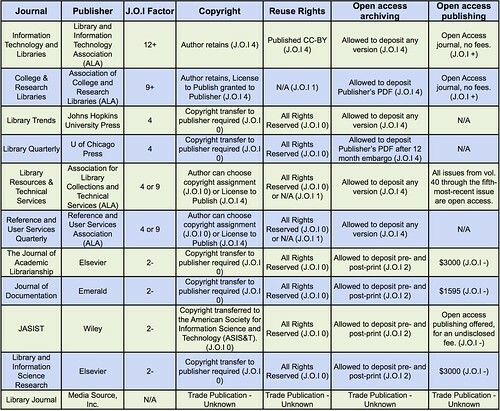 Despite librarianship’s ongoing waltz with copyright complications, 43 of the LIS journals we reviewed still require the author to transfer all copyrights to the publisher, “during the full term of copyright and any extensions or renewals… including but not limited to the right to publish, republish, transmit, sell, distribute and otherwise use the [article] in whole or in part… in derivative works throughout the world, in all languages and in all media of expression now known or later developed” (emphasis our own).12 However, leaning toward a more expansive rights agreement, 61 journals allow the author to retain copyright, 38 of which require a License to Publish be granted to the publisher.13 21 of the 38 that require a license granted to the publisher are Taylor & Francis journals, which fall under their new author rights for LIS journals. Taylor and Francis shows leadership in adapting their rights agreements for LIS journals, although one co-author of this article sought to push them further, with success. The remaining 23 journals that allow the author to retain copyright also offer the article to be published under a Creative Commons (CC) license, ranging from Attribution-Non-Commercial-No Derivatives (Collaborative Librarianship) to Public Domain (First Monday). The boldest and most progressive copyright policy goes to First Monday, which offers total author choice, from copyright transfer (©), through every possible Creative Commons license, to releasing the work in the public domain (CC0). Snapshot: 38% of the journals require full transfer of copyright; 54% of the journals allow authors to retain copyright; 5.4% had a choice between full copyright transfer and retaining some rights; 2.7% were unknown and 0.9% had joint copyright between the author and publisher. This category provided the broadest range of possibilities, mostly due to the fact that different publishers assign different terms of embargo for self-archiving. Assuming that well-informed LIS authors who submit to these journals desire the simplest and broadest open access options, 24 journals allow the pre-print (submitted version), post-print (accepted version) and final published PDF to be archived in an open access institutional repository, with no stated embargoes. 22 of these 24 are fully open access journals, and they are all published by societies, associations, universities or self-affiliated groups. Common thought in academic publishing tends to say that society/association publishers lose the most when going open access; it is heartening to see this is absolutely untrue in LIS literature. The strictest embargo on self-archiving in an institutional repository is 18 months for 10 of the Taylor and Francis journals. University of Texas Press and University of Chicago Press both allow archiving after 12 months, while ironically, given the topic of the journal, the Journal of Scholarly Publishing published by Toronto University Press only allows archiving of the pre-print with no policies for post-prints. The practice of self-archiving is totally dependent on copyright transfer agreements, and based on the representative sample of LIS journals we reviewed, all but 8% had direct or implied policies regarding what the author is allowed to do with specific versions of the same work. The author’s false sense of control over their work and the publisher’s exploitation of that sense deserves a study unto its own. Suffice it to say that if the field of Library and Information Studies considers a green open access policy a good deal, there is much work to be done. Snapshot: 45% allow pre-print and post-print archiving; 13% allow pre-print and post-print archiving after 12-18 months; 21% allow pre-print, post-print, and publisher’s PDF to be archived; 4.5% have unclear policies and 2.7% are unknown. A common misconception about achieving open access is that it always requires a fee on the part of the author. While this mostly true for traditional commercial publishers attempting to retain their income stream while “acquiescing” to the desires of their authors, it is a falsity broadly, which is proven in our analysis. 56 journals offer open access on an article-by-article basis and require an article processing charge (APC) ranging from $300 to $3,000. 52 of these are published by commercial publishers (Elsevier, Sage, Springer, Wiley, Taylor and Francis, and Emerald). In stark contrast, 35 journals on our list are fully open access and all articles are published without a fee. A significant number, 20 journals, either do not offer a “gold open access” publication option or do not publicize it. A number of the 20 journals that do not offer or publicize a paid open access business model are University Presses (6), and association/society journals (7). Snapshot: 32% of journals are already Open Access and publish without a fee, 50% offer open access publication options through an article processing charge, and 18% of journals offer no gold option or do not publicize it. As noted above, within these LIS journals there is considerable diversity in policies. We wanted to further explore that depth of difference by looking specifically at the fully open access journals in our sample. This section reiterates some of the analyses from previous sections, but we thought it still important to enumerate the complexities of publishing within this subset of a subset. 38 of the 111 journals that we looked at are open access, and only two (The International Journal of Library Science and IFLA Journal) have a publication charge, $300 and $1500 respectively. While two of the 38 open access journals require a full copyright transfer (International Journal of Library Science and Student Research Journal) a little more than half of them (21) allow the author to keep copyright AND attach a Creative Commons license to the work.15 27 of these fully open access journals allow the author to deposit the final published PDF in a repository, meaning that 11 fully open access journals either place some restrictions on the reuse of open access content or have poorly defined reuse policies. Even though these are open access journals, the data suggests that what qualifies as “open access” even within our own field is still loosely defined, a point we attempt to illustrate by applying the J.O.I. Factor at the close of this article. Some might make the argument that any restriction of authors’ rights (copyright) and readers’ rights (reuse via licenses) toes the line of not achieving pure open access. Emily Drabinski, a reviewer of this article, made the salient point that the policies we discuss as needing to change are under the purview of journal editorial boards who are often in the complicated position of being between authors (colleagues) and publishers. To that end, we encourage journal Editors as well as authors to lead by taking action. Regardless, as the measures of openness are more effectively discussed within our communities of practice, the LIS field is making slow progress toward public access (readability) and open access (re-usability), a trend we expect to broaden and deepen. This article illustrates something with which every researcher in the field of Library and Information Studies must contend. A significant percentage of our professional literature is still owned and controlled by commercial publishers whose role in scholarly communication is to maintain “the scholarly record,” yes, but also to generate profits at the expense of library budgets by selling our intellectual property back to us. Conversely, there is much to be proud of, including the many association, society and University-sponsored journals that are well-respected and proving important points about the viability of open access as a business model, a dissemination mechanism, and a principle to which librarians hold — our “free to all” heritage. It is our hope that this article inspires the activism that the earlier articles from our review of the literature pointed out as a disturbing discrepancy in our professional practice. Simply, this is our call for librarians to practice what we preach, regardless of, or even in the face of, tenure and promotion “requirements,” long-held professional norms, and the unnecessary fear, uncertainty and doubt that control academic publishing. We already have models for activism on the collections side of our work; we call our colleagues to echo those impulses on the production side of scholarship, as editors, authors, bloggers, library publishers, and consumers of research. There are three practical means of seeding this change; 1) exercise the right to self-archive every piece of scholarship published in LIS journals, or better yet never give those rights away in the first place; 2) move the “prestige” to open access, meaning offering the best work to journals that are invested in a more benevolent scholarly communication system; and 3) as editors, work diligently to adapt the policies and procedures for the journals we control to align with our professional principles of access, expansive understanding of copyrights, fair use, and broad reusability. Returning to “Nixon’s list,” which proposed a possible ranking system for LIS journals, it is interesting to grade her list in terms of the “openness” criteria we’ve employed in this article, and in light of the practical actions we propose. Nixon’s findings present 18 journals that were determined to be the “Tier One” journals, based on the criteria she and her colleagues developed.16 11 of those 18 were also identified as top LIS journals from her literature review. Table 2 shows those 11 “prestige” journals, as graded by our applied J.O.I Factor. The results are striking. College and Research Libraries, widely regarded as a top journal for practicing librarians, received a J.O.I Factor of 9+, whereas Information Technology and Libraries (ITAL) measures at 12+, all because of ITAL’s generous Reuse Rights policy (CC-BY). JASIST is tied for last place (J.O.I Factor 2-) with Elsevier and Emerald journals because of copyright transfer requirements, no reuse rights and middling author posting allowances. Library Trends and Library Quarterly (university press journals) sit solidly in the middle, entirely due to their author posting policies which allow posting the Publisher’s PDF. Based on this, in closing, we submit these final questions to the LIS research community: are these the journals we want on a top tier list, and what measure of openness will we define as acceptable for our prestigious journals? Further, how long will we tolerate measurements like impact factor and h-index guiding our criteria for advancement, while accounting for very little that matters to how we principle ourselves and our work? Finally, has the time come and gone for LIS to lead the shifts in scholarly communication? It is our hope that this article prompts furious and fair debate, but mostly that it produces real, substantive evolution within our profession, how we research, how we assign value to scholarship, and how we share the products of our intellectual work. Our thanks and gratitude go to Emily Drabinski for her thoughtful, helpful and engaging comments as the external reviewer of this article. Thanks also to Lead Pipe colleagues and editors, Ellie, Erin, and Hugh, for challenging our ideas, correcting our bad grammar and making this lump of coal into a diamond. Most of all, thanks to Brett for proposing the term “Journal Openness Index” to replace our not creative and weird-sounding original concept. Thanks for mentioning the work that authors in College & Research Libraries have published in recent years regarding open access and its adoption by scholars in LIS and other fields. C&RL has been invested in open access issues, not just as a trend in the research in our field, but in its own practice, as we have made a complete transition in the journal from a traditional subscription model to a fully OA model (and one that includes equally free and open access to our entire, 75-year backfile). Essays accepted for publication in C&RL are openly available to all, for free, throughout their lifecycle from pre-print to fully-formatted and published article. I did want to point out one discrepancy in your analysis of C&RL’s openness, however, and that has to do with “re-use rights”: all articles published in C&RL include a CC-BY-NC license, which you can see noted on both the abstract page and the full-text versions of any of our current articles, e.g., the aptly-titled “Beyond Gatekeepers of Knowledge: Scholarly Communication Practices of Academic Librarians and Archivists at ARL Institutions” (March 2014), available at http://crl.acrl.org/content/75/2/145.full.pdf+html. With this data point updated, I hope our “J.O.I. Factor” may even increase! Hi Scott – Thanks for the clarification. We did a lot of the data analysis over the past year, and were sure there would be things we overlooked, or that had changed. I am a big fan of the work over at C&RL for all the reasons you mention, so I hope you’ll forgive the oversight. One suggestion, if I may be so bold – the CC-BY-NC license is buried a PDF. Is there any reason it couldn’t be clearly indicated on the “Instructions for Authors” page, or plastered on the front webpage of the journal? Aside from our argument for greater openness, we also want to push LIS literature to be transparent and clear. Using the easily recognizable Creative Commons logo would go a LONG way too. And, since I have your ear, why the decision to impose a CC-BY-NC on C&RL authors? Why not follow the lead of First Monday and allow full author choice? What does the NC actually practically accomplish? Why is C&RL still enforcing standards that are hangovers from print publication (ultra prescriptive reference and citation rules, assignment of page numbers)? And, my biggest beef with C&RL, why the pre-print bottleneck? If the article is accepted, and your platform is digital, why not release it as “published” and do away with the constrictions of Volume and Issue, which don’t matter anyways except for the legacy of a print publication? I am a supporter of everything you all are doing over there, just want to make sure you know I think there is plenty of room to grow. If C&RL truly embraced open access and digital publication, I believe it should look more like PLOS with First Monday’s rights/reuse structure. Micah – you are correct that the “Instruction for Authors” page needs to be updated, not just for the item you note, but also to highlight our support for links to open data, etc., that are now possible. Maybe even to acknowledge the possibility of an open peer review option (depending on how that experiment goes with one of your Lead Pipe colleagues). Such an update is on my “To Do” list for the year. Not on my list, though, are the changes you suggest regarding formatting and the continued release of specific issues of the journal. The reason these changes are not on my list, valid options though they are, is because they are not currently supported by the broader community of C&RL readers and authors. In reader surveys and focus groups conducted as we planned for the transition, the retention of these legacy markers of quality of content were specifically noted as important to continue. By increasing the number of articles included in each issue, we are on target to shrink the time to publication significantly over the next year, but to do so in a manner that retains important characteristics of our print heritage that readers and authors told us were important for the continued vitality of the journal. We’ll continue to engage our community in the coming years on issues like this, and I am sure the journal will continue to grow in the right direction for a top-tier, peer-reviewed, OA journal in LIS. Glad to hear, and I understand the many layers of complexity in moving something like this along. I’d be really interested in conducting that survey of C&RL readers and authors now, as scholcomm seems to have developed so drastically in the 3 years I’ve been a librarian. I’d wager that the results might be different. If it ever comes to a vote, mine will be surely on the side of eschewing those “legacy markers of quality” since I believe nostalgia for legacy impairs innovation. All that said to say, I’m on your team! Do great things! Innovate! 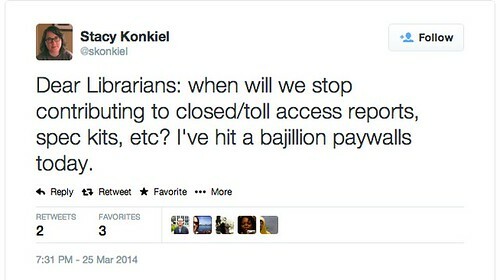 Lets lead scholarly publishing rather than react! Thank you so much for this very valuable work. I’m wondering how you feel about electronic journal license terms on allowing or prohibiting interlibrary loan as another measure of Journal Openness. Often, electronic journal licensing terms are restrictive or unclear, expressly prohibiting or simply deterring libraries from sharing electronic journal articles with other libraries. With print materials, we have Fair Use Best Practices to rely upon; with electronic journals, we additionally have to contend with restrictive licensing terms in addition to copyright matters. This is a frequent barrier we have to contend with in Resource Sharing as we seek to connect users to resources they need. Hi Silvia – I think you’re absolutely right on the money that ILL-ability is another incredibly important measure of openness. In fact, after publishing this I came across this LibLicense project that hopes to deal with exactly that issue. My ultimate hope would be, that if a journal is fully open access there would be little to no restrictions on re-usability, including interlibrary loans. An issue that we will have to contend with, that this article might hint at, is that many of these complications come from the fact that academic publishing is currently controlled by publishing companies. They have every interest in restricting the access and usability of the content because it is their business model. We are hoping and seeing that initiatives like Library Publishing are altering this system a bit, and it would make sense then that publishing would be more in the interest of information access than restriction. I’m hopeful that the system will evolve so that concerns like yours simply won’t exist anymore.